As EU leaders meet in Brussels to finalise details of last week’s controversial deal on sending refugees back from Greece to Turkey, Access Info Europe is launching an access to information campaign digging into the legality of the agreement, and asking EU institutions whether they sought legal advice on or properly evaluated the human rights impacts of the deal. 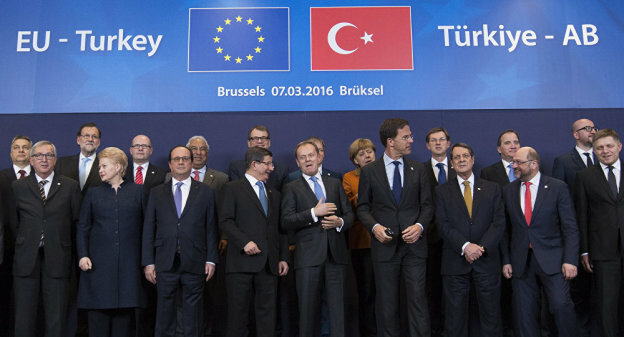 The three initial access to documents requests, sent to the Council of the European Union, the European Commission, and the European Parliament, also ask for legal advice-related documents in regards to the pre-existing 2014 Agreement between the European Union and the Republic of Turkey on the readmission of persons residing without authorisation, given concerns that have been raised about its conformity with EU and international law. “With key human rights bodies such as the Council of Europe’s Human Rights Commissioner and the UNHCR raising the alert about the dubious legality of the EU-Turkey deal, it is essential that the public should know whether this decision was taken with absolute legal certainty in regards to European and international law,” stated Helen Darbishire, Executive Director of Access Info Europe. Access Info has already been submitting requests with the EU’s border agency Frontex to investigate the data it holds on refugee flows after EU Vice President Timmermans blundered by stating that some 60 percent of the arrivals in December come from countries where there is no conflict. In fact, data from the UNHCR and Frontex show that Syrians accounted for around 39 percent of all arrivals in Greece in December, with Iraqis and Afghans making up another 48 percent: a total of almost 90 percent the people who arrived by sea in the EU in December came from countries gripped by war or emerged from a wider regional conflict. Access Info is planning a further series of information requests to EU bodies and Member States about the data they hold and their response to the refugee crisis. “Transparency around the decisions taken by European institutions and Member States while dealing with this crisis is imperative. The information is needed to ensure an informed public debate about how best to respond in a way that ensures respect both for international law and the human rights of individuals,” concluded Darbishire.